Here are the contents of my March 2013 Topbox. I know you have probably seen so many of these but I took the pictures so I thought why not share! I was actually very unimpressed with this and the previous few boxes and cancelled after a year of being subscribed. I recently have had many problems with them, they forgot to send my box once when I switched payment methods (from directly taking the payment from my bank account to Visa instead), and I live so close to their location yet I get my box after everyone else. Also I got a duplicate product in my December Topbox (the Kellett acne gel stuff), and a MUFE powder fd that is way too dark for my skin in my February box. I just feel like we have been getting leftovers and duplicate products lately, and to me Topbox has really gone downhill. It seems like it is way more about highly increasing profit rather than keeping and pleasing their loyal customers. April will be my last box. 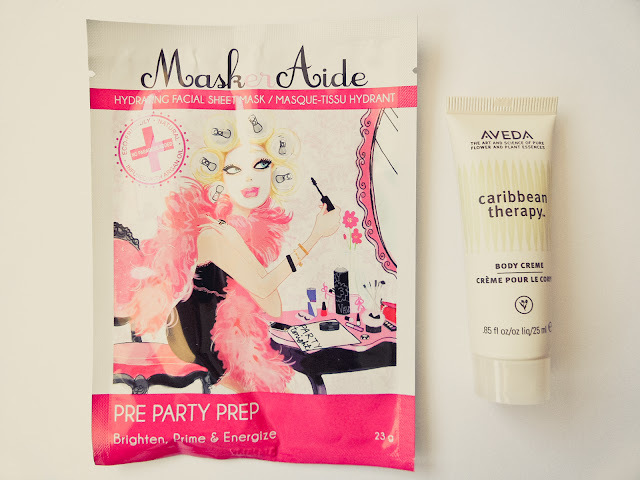 Maskeraide Pre Party Prep Hydrating Facial Sheet Mask: I actually won the same mask from xLaMaria's giveaway a few months ago and I've gotten others from Topbox and BB5 before. I wish I had gotten one that I haven't already tried. I am upset that they sent these again, even though it is a different "type" I think they should have focused more on sending up different products/brands to try. Aveda Caribbean Therapy Body Creme: I wasn't too happy with this either, mainly because I didn't choose the Aveda box so I was not at all expecting something from Aveda. Many people have said this cream smells terrible, however, I can stand it in the bottle, but then when you put it on it smells a lot more like grass.. or fertilized dirt.. I don't know! I don't really like it and would not be able to sleep with it on. Hopefully I can get the bf to use it. The price is outrageous! 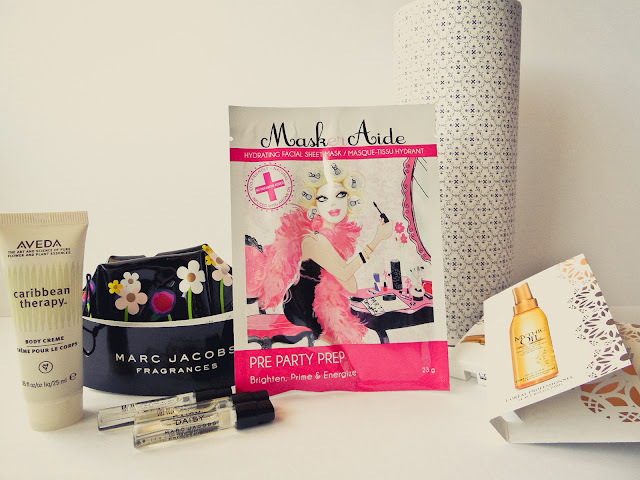 Marc Jacobs Discover Kit/Sampler Pack: When I saw this I was like "omg the bag is so cute!" But then, I realized you can't use it for anything! Can barely stick my fingers in it. Just a bad design and waste of manufacturing.. the zipper should have gone down a lot more. 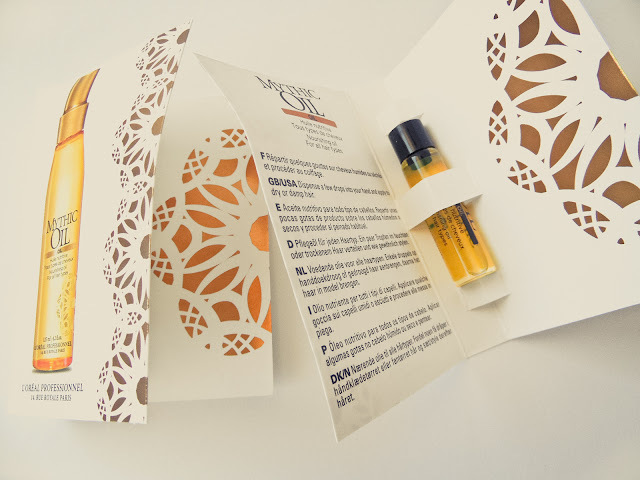 L'Oreal Professionnel Mythic Oil: I don't mind a LOreal product. But I haven't seen this anywhere. I get Topbox and their whole "we never sample drugstore brands', but if your going to anyway, at least make it so its affordable and conveniently available! This is only available at professional salons, and again, way overpriced. Although I did like the way it felt on my hair. Topbox, what is with sampling us with overpriced products lately!? 3 things in this box are priced way out of my budget and I don't like floral fragrances so I wouldn't buy the Marc Jacobs perfumes anyway! I just feel like, their business practise has changed, and they are less focused on having us try new things or develop interests in new brands. I'm really disappointed, because I was so impressed with them a year ago, but now, I will likely stop getting these beauty boxes altogether, as they just aren't worth it for me. 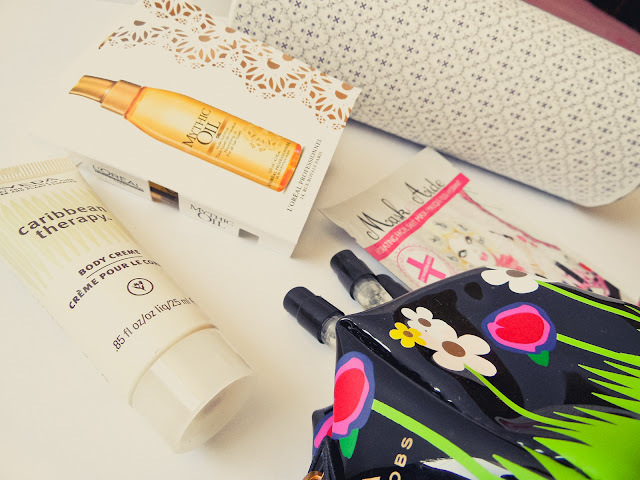 Here is my January 2013 Topbox. NOTE that the lipstick is a replacement for a duplicate product from the month before. Above is a photo of my lips before and then with the Clinique Different Lipstick in Think Bronze. I don't like it too much, I think the photo makes it look better than it really is. Eyeshadow duo is: Like Mink. I didn't even take the time to value this box I dislike it that much! I just placed it at $40 based on what others were stating the value as. 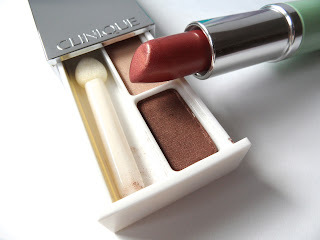 Anyway, I was never really fond of Clinique since it gave me skin problems when I tried my aunt's toner and cleanser.